Hello Elder Scrolls Online Friends! You awaited the much anticipated release of Elder Scrolls Online, you created an amazing player character for your adventures in Tamriel, and you have found lock-picks even as you have escaped Cold Harbor in one piece! You see a shiny treasure chest and you just know there is some loot within – but it’s a locked chest – now what do you do? Well, that is what this Lockpicking Guide is here to tell you, so you can pick those locks, open those chests; and claim your surprise goodies within! In the Elder Scrolls Online (ESO) game-world you will need to know how to lock-pick to enable you to open various treasure chests, some locked doors and other locked items you will come across in your adventures. You will need lock-picks, so whenever you find them, pick them up and/or buy them from vendors, so you will have plenty of lock-picks on hand when you need them. To start out with, you will want to know the basics of Lockpicking to get past even simple locks, but fear not because the more you practice Lockpicking the better your Lockpicking skill will become. Before long you will be opening intermediary lock leveled chests, and eventually you may be an expert; who can get into just about anything in higher level areas where the locks are harder; but the loot is better too. When you first encounter locked chests, you will notice that when you click on them to open them, you get a message that they are locked with the lock level shown, and you will be given the chance to either try to lock-pick the chest or to force the lock. If you have lock-picks in your inventory, we would suggest trying to unlock all the locks you can, (regardless of their quality called ‘lock level’), to gain the practice that will improve your lock-picking skill; even if you think they are too high-level for your lock-picking skill at that time. When you start to try to pick a lock, a timed interactive image of the inside mechanism of the lock will appear with five spring-loaded weighted cylinders called pins inside, and it will also show your lock-pick which you will be able to manipulate over the pins. This is so you can slide and wiggle the lock-pin around inside, to press down on one pin at a time by clicking your left mouse button to press down to hold-down on each chosen pin with your lock-pick for as long as you choose for each pin, till you run out of time. However, the trick is to align your lock-pick over the pins and press down on any pin only until you feel it start to wiggle, because then you should very quickly release it, or your lock-pick may break and it won’t stay down, but will reset. While you are pressing on the pin it will seem to have a glow. If you succeed by letting go of pushing it down quickly enough when you felt it quiver or wiggle under your pressing, (and not too soon or too late) then it will not reset, and you can quickly move to another pin and repeat that action with all the pins; until the lock opens. You will be able to see a timer, so if it looks like you are going to run out of time before succeeding, you have nothing to lose by trying to force the lock at that point. If you are lucky you still may win the Lockpicking session that way. You can choose to take your chance at forcing the lock at any time that the timer is still running. Either way, do not be too disappointed if you do not get in the first time, because the timer will then have a brief cool down period before you can try again, but if you are patient in between turns; you can try as many times as you want till you run out of lock-picks. Note: other players around you may also want to benefit from the chest you are trying to unlock. If your attempt is not successful, other player can try to open the chest while you are waiting the end of cool down. Otherwise, remember that even if you do not always pick the lock and get the loot at first -- you have not lost anything but lock-picks by trying -- and you have gained valuable Lockpicking experience through any attempts. Your Lockpicking skill keeps improving each time you level up and you will be getting into that loot-box, those chests or through that locked door easier as you grow in skill. As your Lockpicking skill improves with that practice, you will reap the rewards more and more! However, if any hostile NPCs or monsters attack you and interrupt you while you are Lockpicking; you may choose to stop and deal with the attacker and go back to your Lockpicking afterwards! By the way, if you have played the Elder Scrolls Oblivion game in the past, then you will understand ESO Lockpicking better from the start, because these locks in this multiplayer game Elder Scrolls Online game are very similar to the Lockpicking puzzle game in that Oblivion game; although a bit different from locks in the Morrowind or the Skyrim games of the Elder Scrolls series. 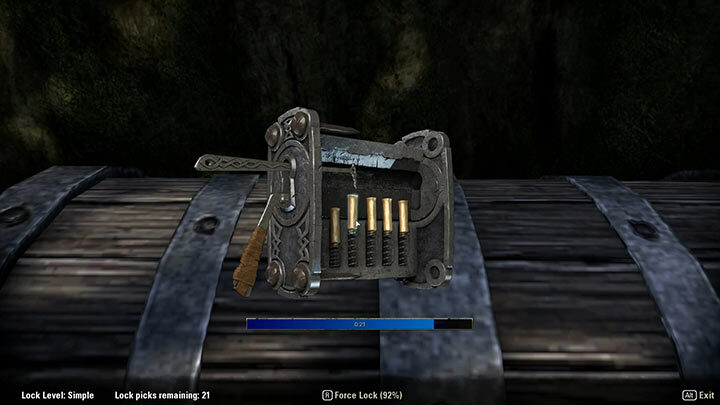 Yet whether you are a seasoned Elder Scrolls player or new to the series with the Elder Scrolls Online; by using this guide, you have all you need to start having fun getting Lockpicking right away! Have a great time ESO friends, and wishing you lots of awesome loot!